Whatever your opinions on the Labour leader Jeremy Corbyn, it's very easy to see what he stands for. There's obviously a lot of deceptive interference being run by right-wingers who despise Corbyn's political stance and want the public to believing in a terrifying caricature of the man rather than thinking about his actual policies, but if you haven't picked up the basics of what he stands for by now, you've really not been paying attention at all have you? Public ownership: Jeremy Corbyn believes that public infrastructure and services should be run as democratically accountable not-for-profit organisations for the benefit of the British people and the British economy, rather than businesses with the primary focus of extracting huge profits at the expense of the British public and the British economy, in order to enrich their private owners. Foreign policy: Jeremy Corbyn believes that the most effective form of conflict resolution is usually dialogue between both sides, he opposes imperialist wars of intervention because they create lawless terrorism breeding grounds (Iraq, Libya, Syria ...) and he is strongly opposed to the sale of British made weapons to tyrannical Islamist regimes like Saudi Arabia, especially because it's known that they're being used to commit war crimes against civilians in Yemen. Social benefits: Jeremy Corbyn believes that things like health care and education are social benefits that everyone should be entitled to, not commodities to be restricted to only those who can afford to pay for them. That's why he wants to renationalise and properly fund the National Health Service, and to introduce a National Education Service to provide free education to everyone. 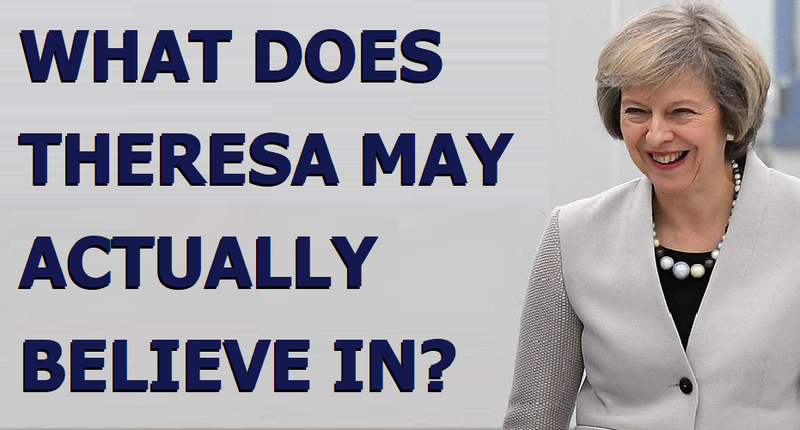 When it comes to Theresa May, the question of what she stands for is almost impossible to answer. If you judge her solely by her words she cares about things like social mobility, making Britain a fairer place, and making sure nobody gets left behind. However if you judge her by her actions, she's clearly driven by a desire to reduce social mobility, and to make Britain a more unequal place where ever more people are getting left behind while the mega-rich elitists get richer at a faster rate than ever before. Take May's crocodile tears in her inaugural speech over poor working class boys being the least likely to go to university of all. But then one of her very first actions as Prime Minister was to completely scrap the system of maintenance grants designed to help students from the poorest backgrounds! Take Theresa May's claims that she wants to make Britain a fairer place. Then she continues with the hard-right wage repression and austerity policies that impoverish the poor and ordinary as the mega-rich literally double their wealth, and fall hardest of all on low-income women. How can anyone see these brazen Tory economic attacks on students from poor backgrounds and low-income women as being remotely compatible with all of Theresa May's fine words about wanting to make Britain a fairer place? Her speechwriters clearly believe that millions of British people are too lacking in critical judgement to spot the glaring contrast between the cruelty and elitism of Theresa May's policy decisions, and the deceptive saccharine slop they fill out her speeches with. They honestly seem to believe that a significant proportion of the British electorate are so naive that they prefer to judge people on their fine words, rather than by their repulsive and highly contradictory actions. May's willingness to say literally anything her speechwriters put in front of her, no matter how glaringly these fine words are contradicted by her actions, makes it seem difficult to discern what she actually believes in. However this willingness to deceive is actually one of the biggest clues of all. Her willingness to engage in this kind of deception makes it clear that she's prepared to do pretty much anything to serve her own interests. She knows that a certain demographic wants to hear noble words about her Christian faith and her desire to make Britain a fairer place, so that's what she says. But she also knows there's another demographic who fear and despise social mobility, and they're the ones who pour millions in donations into the Tory party, so she makes a big show of deliberately attacking social mobility to keep them happy. Anyone who can act in this grotesquely dishonest two-faced manner clearly has no real principles at all, and is guided solely by their own selfish self-interest. Then there's Brexit: The way she campaigned in the weakest possible manner for Remain because keeping her job as Home Secretary was the number one priority from a career perspective (Remain win = natural successor to Cameron / Leave win = holder of high office of state and "safe pair of hands" candidate to replace Cameron); the way she immediately switched from Remain to hard Brexit extremism when it suited her career to do so; the way she bribed the DUP bigots into backing her so as to retain her grip on power; the way she continually dances to the tune of the secretive cabal of Tory hard Brexit fanatics because she knows that she's finished as Prime Minister the moment they turn on her. In light of all of this, how is it even possible to see her as anything but the self-serving charlatan that she is? This deceptive and self-serving behaviour is grotesque, but in a way it's actually understandable because Theresa May is a woman who has clearly been brought up immersed in the bizarre hard-right dogma that humans are essentially self-serving economic units (homo economicus) and that the more ruthlessly self-serving people are, the more efficiently the economy operates! In a way Theresa May is actually the logical product of the four decades of fanatical hard-right dogma that has infested the British establishment ever since Margaret Thatcher introduced it in 1979: A political leader who sees the serving of her own personal self-interest, not as a vice, but as an expression of the highest possible virtue. So she doesn't care how incredibly damaging it is that the UK is lumbered with such a weak, directionless, self-serving, and downright dishonest Prime Minister as we face up to the most complex and risky diplomatic challenge since the 1940s, her only real political principle is to do whatever it takes to serve her own personal self-interest. She'll lie, and deceive, and evade responsibility for her actions, and repeatedly act against the best interests of the nation, because her priority will always be to do what is in her own selfish self-interest. 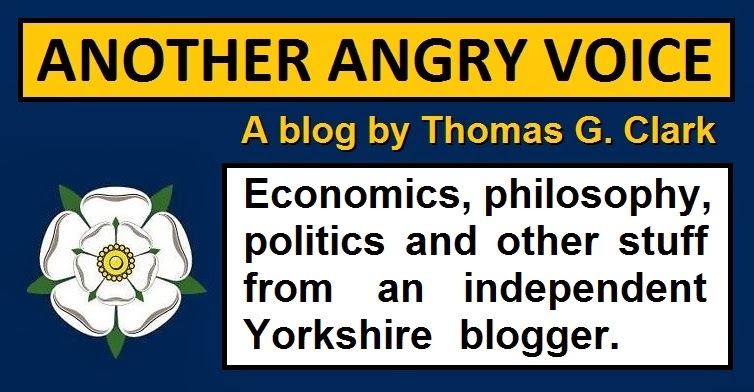 And anyone who expected Westminster's four decade obsession with hard-right Thatcherite dogma to turn out any other way clearly wasn't paying attention to the "greed is good" ideological lunacy that underpins it all.